Looking Forward to a Fantastic Summer in Athens! For the last 3 years, I have been happily wandering through your glorious streets and parks, excitedly immersing myself in your own unique culture of Southern charm, and well frankly, just generally falling in love with your every quirk. And during that time, we’ve gotten to know each other pretty well, but now that I’ll be taking on the P.R. and Social Media internship position for the Athens Convention &amp; Visitors Bureau this summer, I think it’s time I properly introduce myself. 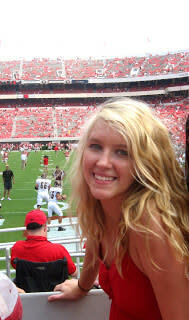 My name is Morgan Capps and I will be a senior at The University of Georgia in the fall, soon completing my studies in Psychology, Geography, and New Media. My unusual combination of studies allows me to explore a wide range of interests, a personal tendency that extends to my non-academic life as well. From hosting my own show on UGA’s student radio station, WUOG 90.5 fm, to acting in a production with Town &amp; Gown Players, the local community theater, I am certainly no stranger to taking advantage of the awesome opportunities you have to offer, Athens. But even after 3 years here, I still constantly find myself discovering new places, people, and events existing throughout town. I can think of no better way to spend the summer than by assisting Athens CVB in diligently seeking out and sharing information on the who, what, and where that combine to make life here so uniquely interesting. I genuinely cannot wait to provide information on your many wonderful restaurants, attractions, special events, and festivals. I promise to blog and otherwise report my many adventures, observations, and ideas, but I’ll need your help, Athens community- I want your feedback and suggestions. So don’t be shy, send me somewhere new and let me know what’s on your mind so we can make the most of this beautiful summer in Athens, GA.